Scalers | Repair Management Nederland B.V.
For a complete overview of the Tercoo Rotating Discs see our special pages. 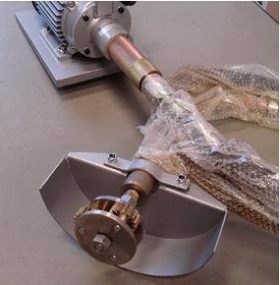 Flexible shaft scaling machine Ikaflex portable type. The Taurus Ikaflex scaling machine is a comparatively light, multi purpose scaling machine. Easy to use principle makes it a strong and durable machine. With the world wide available spare parts a suitable machine for quick and easy tasking descaling in small corners and hard to get by places. Due the of different kind of cutters, flails and brushes suitable for all kind of descaling on ships, industry and utility. Application: Quickly removes rust, dirt, weld slag, etc.. Essentially cleans uneven surfaces. The tool’s flexible needles can easily adapt to work on any surface, even those with projections. 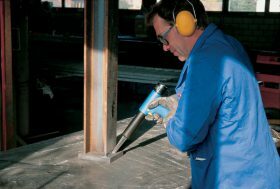 Swiss quality products for surface preparation more than 70 years swiss quality from Von Arx Ltd. 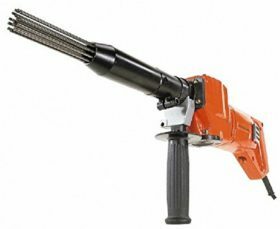 Heavy duty and medium duty machines even with low vibration system. 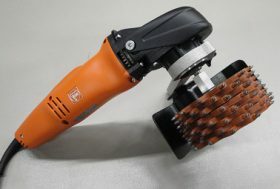 Some of the scalers can also be used with a chisel. 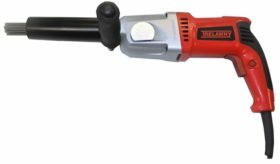 Trelawny needle scalers for medium duty jobs. Electric needle scalers are available in 230Vac, 110Vac and 115Vac. Standard equiped with 3mm needles. 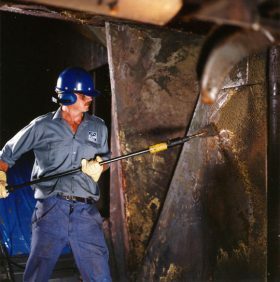 Bristle blasting is a new process that uses a specially designed rotary bristle tool for achieving both corrosion removal and an anchor profile. 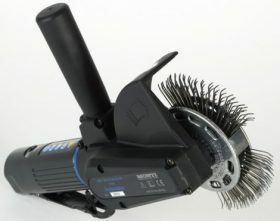 The rotating bristles are DYNAMICALLY TUNED to the power tool, which results in impact and immediate retraction of bristle tips from the corroded surface. 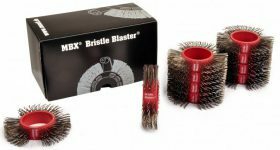 The bristle tips are designed to strike the corroded surface with kinetic energy that is equivalent to grit blast media, thereby generating a texture and visual cleanliness that mimics the grit blasting process.